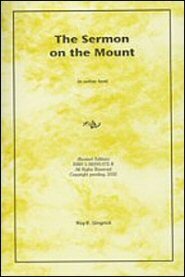 Although “The Sermon on the Mount” is addressed to the professed heirs of “the Old Testament Prophetical Kingdom,” it has application to Christians today. We Christians, along with these heirs of the Kingdom, are to be the salt of the earth and the light of the world and we, as well as they, are to be not anxious about the things of tomorrow. How sweet are the instructions that God gives to all of His children in “the Sermon on the Mount”! What blessings do we receive when we open our ears and hearts to this message from God!